I decided to leave out the usual things like my sewing machine, scissors and pins and such, and instead tell about the more unusual bits and bobs. - One of the things I couldn't do without is my lovely little tape roller that I got in Stockholm (it's made by Muji). It's the perfect size for cleaning up plushies before a photo and the glue on the tape is just the right stickyness; it gets out all the fluff and cat hair, without taking off the nap from velvet or mussing up the fluffiness of fake fur. It also has a little holder to keep it safe when it's not in use. 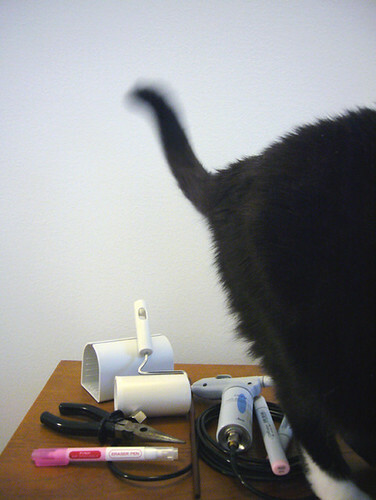 - The pliers are for pulling through needles when I'm hand sewing something a bit thicker and tougher, and it's hard to get a good grip of the needle or the strength of my fingers alone isn't enough to get the needle through. - I love, love, love my Clover air erasable fabric marker! I can draw any markings I need where ever I want and not worry about the marks being visible, as they fade away with time. And if you're wanting to get rid of the marks right away, you can use the other end of the pen to erase them. Unfortunately my magical marker is running a bit dry now, and I'll have to see about finding a new one soon. 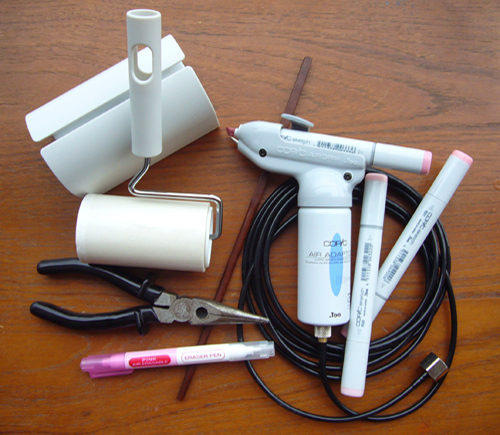 - The Copic airbrush & markers are what I use for giving the Rag Pets their blushy cheeks. I've had Copic markers for ages (I use them for colouring my drawings) and I got the airbrush system as a birthday present last year. Before that I'd been "drawing" the blush on by hand, which was slow and surprisingly hard to get nice. What's not pictured are the cans of air/generator that plug into the other end of the hose. In addition to all the wonderful crafty folks out there, I'm also very thankful for my boyfriend, family, friends and of course my cat, BooBoo. I went to a craft fair yesterday. It was so great! There was a lot of wonderful and inspirational stuff there and now my head is filled with new ideas! I spent a lot less money than I thought (or feared, to be honest) I would. 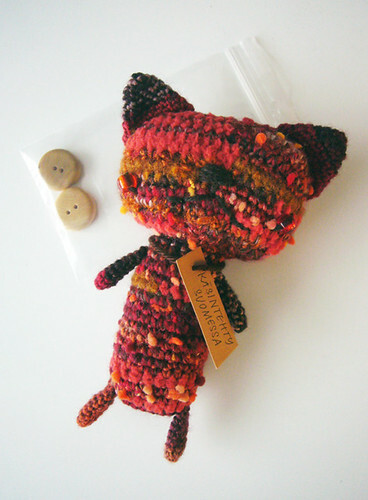 I only bought a super cute crochet kitty named Paprika made by the talented Megi Pupu and I also found some juniper wood buttons that smell lovely and that are most likely going to end up as belly buttons for future Rag Pets. I've been a fan of Megi Pupu's work for ever and ever, and I literally squealed with joy when I saw her crochet critters on sale! :) I also very nearly splurged on some pretty printed cotton fabric, but decided against buying it since it was as pretty as it was spendy. I think this fair was more concentrated on the makers instead of the places that sell materials & equipment, unlike some of the previous fairs I've been to. There was such an amazing array of crafts on show, it actually got a little overwhelming after a while. And in addition to all the crafty talent filling the expo center, there was also a farm fair going on at the same time! I petted bunnies, kitties and puppies, cooed at baby chicks and lost my heart to llamas and alpacas. I'm kicking myself for forgetting my camera at home, so I didn't get any photos of the cute animals at the farm fair. What I did get though, is a few contacts through who I might be able to get my hands on some scrap alpaca wool that'd be prefect to use as stuffing.